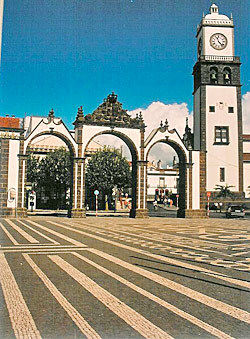 One of Ponta Delgada’s symbols, the three-arched Portas da Cidade, was built in 1783 and is adorned with the royal crown and the coat of arms of the city. This curious town gate construction, located at the Largo de Gonçalo Velho Cabral, which is surrounded by arcades and boasts a monument to the discoverer and first governor of the islands, Gonçalo Velho Cabral, marked the entrance to the city until the harbour was extended, as up to then, the square, in which these gates stand, was close to the coast and represented the landing place for all traffic coming in from the sea. 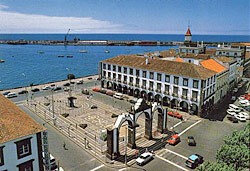 West from here, at the Largo da República, boasting a statue of Saint Michael and a fountain, stands the Paço do Concelho, an attractive Baroque construction from the 18th century, featuring a belfry dating from 1724 adorned with a 16th-century bell, which was offered by King João III.